Dreaming of a life beyond the 9-to-5 daily grind? Ever wonder what it’s like to eat and breathe paradise, day-in and day-out? Meet U.S. and British Virgin Islands charter boat captain, and business owner, Morgan Locke – an adventurer whose job description is best described as: expert vacationer, year-round. Every day is an island-hopping adventure for Locke, who often spends sunrise to sunset exploring new tropical realms. And it’s no wonder – the Virgin Islands are, by nature, the crème de la crème location for an ideal nautical career. What would you say is the most rewarding aspect of being a boat captain? It’s genuinely rewarding to be a tour guide who turns vacations into dream vacations. We once had guests whose sole request was to swim with sea turtles. And that’s just what we did! They spent the day happily holding hands and snapping underwater selfies, making unforgettable memories in the process. Describe your most unique passenger experience. Every time our guests celebrate Christmas Eve surrounded by palm trees, or ring in the New Year on Treasure Island, or spend Valentine’s Day exploring sunken ships off of St. Croix, it’s a surreal experience. It’s an unconventional (and awesome!) way to live life. Being a full-time boat captain means celebrating holidays in non-traditional, tropical ways on the islands. Plus, it’s just fun getting to celebrate special events like weddings and honeymoons, momentous birthdays and retirement with travelers who party big. A few weeks ago, we delivered honeymooning guests to their own remote island in BVI’s Saba Rock – that was really cool. What happened on your most exciting day at the helm? I’d have to go with spotting whales off of Tortola with guests. Breathtaking. What’s your favorite part of each day? Every evening is a stunning sunset cruise back to dock. And there are just no words to describe those colors. What’s your number-one request from vacationers? Probably grabbing a Painkiller at Soggy Dollar – that’s a popular one. Or finding a hidden, remote island in the middle of nowhere, like Sandy Spit. It really varies from guest to guest. The beauty of a private vessel is in being able to reach hard-to-access places, like hidden beaches and lesser-known snorkeling spots. So whether we’re perfecting the quintessential lure with fishing enthusiasts, hiking Jost Van Dyke, or wowing passengers with snorkeling finds, such as massive lobsters, it’s all about crafting the perfect experience that suits each individual’s passions. What’s a typical experience for a cruise ship passenger who charters your boat? We pick up cruise ship passengers from lines like Norwegian Cruise Line and Princess Cruises. The Virgin Islands are an incredibly popular destination with cruise ships, so we make it a point to side-step the mass-conveyance ferries and show guests the best of the islands via custom tour. Passengers love the experience of being picked up by their own private boat for the day. Describe a normal day in your life as a charter boat captain. A typical day could start with hitting the local store to grab a guest’s special requests – some will request a favorite drink or maybe a pizza. Or, if I’m captaining the Sea Ray, I’ll work with the crew to stock it with drinks and hors d’oeuvres. It’s all about the guest experience. From one day to the next, it’s never the same. Traversing long distances and hitting up seven different islands and two countries in one day? Yep, that’s typical. Anchoring at The Baths for a full day of snorkeling, exploring, and hiking? That’s been done. It all depends on guests’ preferences. We develop custom itineraries for our passengers, and we’re always ready to throw the schedule out the window at a moment’s notice, depending on what looks fun! What would you recommend for someone interested in becoming a boat captain? If you’re thinking of leaving it all behind to live the island life and launch a career as a boat captain, you need a passion for the ocean (as well as a lot of experience). If you’ve been an islander your whole life and have grown up on the water, you’ve probably found your niche. You’ve got to love to travel, explore, and meet new people – plus, enjoy an active lifestyle and have an adventurous spirit. 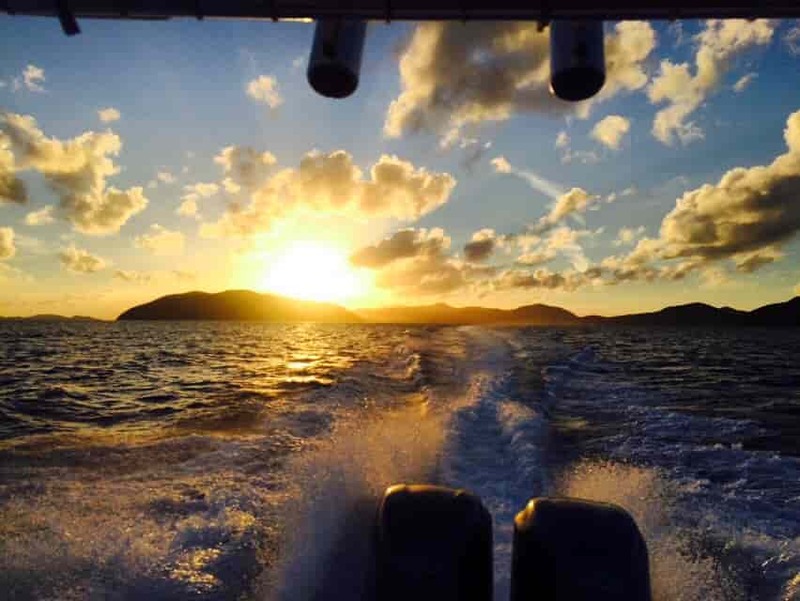 Being a boat captain living in the USVI and BVI can mean many things, but one thing it isn’t is boring. As a boat charter captain, you’re always around vacationers, a.k.a. people having the times of their lives. It’s a richly rewarding career for the expert-level adventurer. At Sonic Charters, our goal is simple: to ensure that your visit to the U.S. and British Virgin Islands is greater than you ever dreamed. Whether you want to swim with the vibrant fish of the reef, kick back on a white sandy beach accessible only by boat, or party it up out on a tranquil bay, we have exactly the rental or charter for you. For $100 off a Luxury Sea Ray Sundancer rental, use Coupon Code: TRAVEL17.